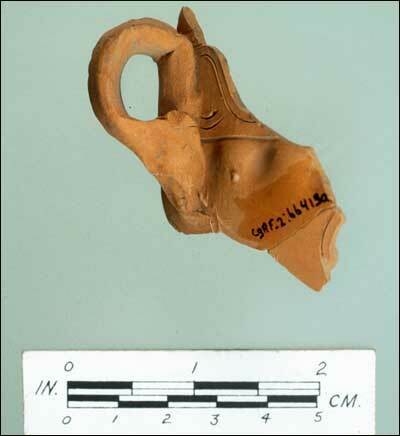 Restored pitcher from layers dating to the early 1500s. It is of Iberian origin and duplicates exactly pitchers found at the 16th-century Basque whaling stations at Red Bay, Labrador. 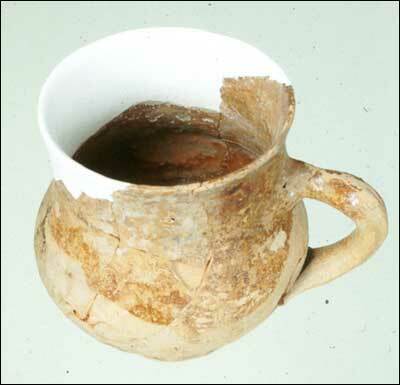 Partially restored North Devon mug dating from the mid-17th century. Base of an elaborately-decorated Rhenish stoneware drinking vessel, made in the Westerwald region of Germany. About 18 cm in diameter at its widest point, it was broken in the late 17th century, perhaps during or not long before the French attack of 1696. 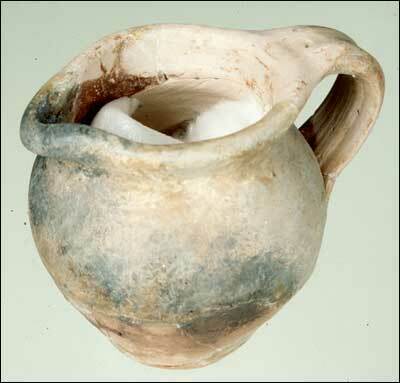 Tin-glazed pot, commonly known as an ointment pot. 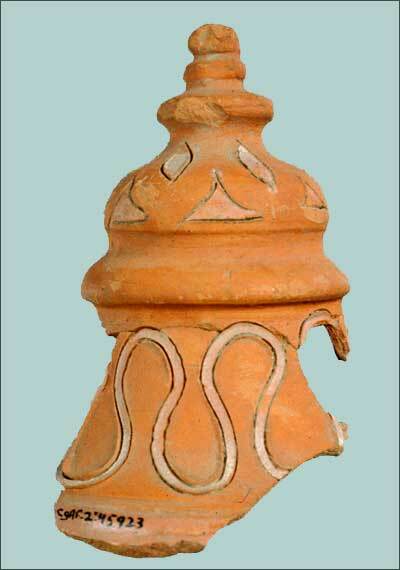 This item is 6 cm along the base. 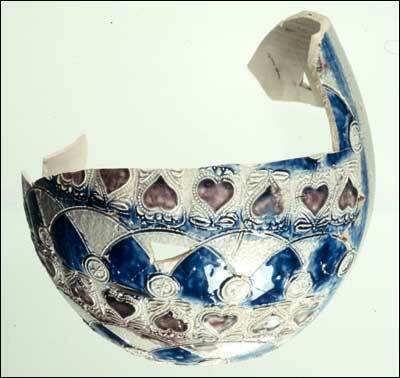 Such decorated ceramics were made at Estremoz, Portugal, in the 16th and 17th centuries. 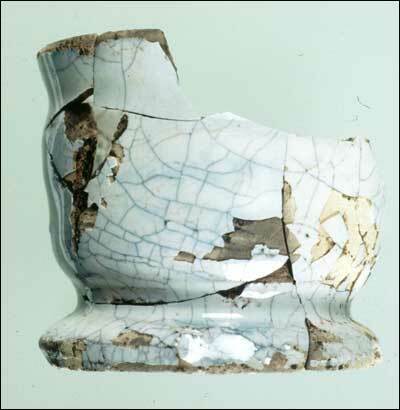 They were luxury items, and the Ferryland collection includes the only such ceramics found in the New World. This item measures about 5 cm at the base. 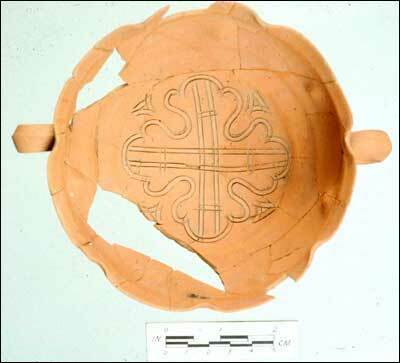 Terra sigillata bowl with incised design filled with white slip. Found in the Kirke house midden and in secondary deposits elsewhere at Ferryland. Foot of one of several terra sigillata vessels that appear to be a set of drinking goblets. Item is approximately 8 cm at the base. Glass buttons from the waterfront, dating to the late 17th century. 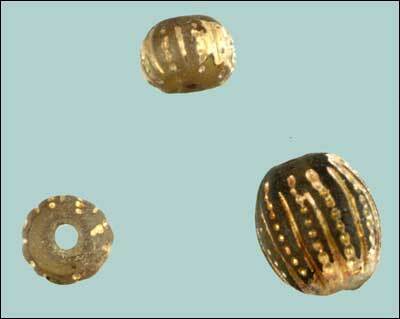 Gilt glass beads were found on the waterfront, but more commonly in the midden from the Kirke house. They date from the mid-17th century and probably once decorated a woman's bodice.